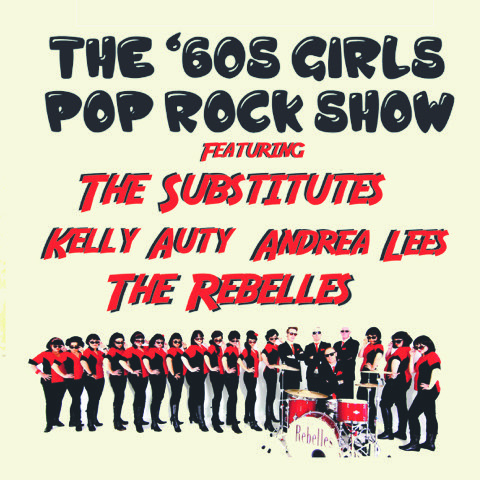 The Rebelles are revved up and ready to once again hit the stage with their good buddies The Substitutes at Kingston Arts Centre on Saturday 30 March. The Substitutes and The Rebelles have put together a special night celebrating the awesome music made and recorded by women in the ’60s. Kicking off with a set from acclaimed ’60s specialists The Substitutes, followed by the live wall of sound of 19-piece girl group sensation The Rebelles, the night then fully amps up with The Substitutes, joined on stage by award winning blues and soul singer Kelly Auty and the sensational Andrea Lees. Pack your inhibitions in the bottom drawer! Dust off your dancing shoes! And shimmy on down to the Kingston Arts Centre for a night of great live rock’n’roll! We’re super excited to be part of the biggest suburban shindig of the year. Over twenty of Reservoir’s finest performers will entertain you across TWO glorious stages at the Preston-Reservoir Bowls Club. Plus: barefoot bowling competitions, the inaugural Rezza Record Fair, and an array of food vendors to satisfy all tastes. Keep an eye on the Facebook page at facebook.com/reservoirstomp for set times and other news. Last year’s show was a sell-out, so you’d better grab your tickets fast! Well you know we Rebelles love to rock out fast and loud – and we always have a blast. But just once we’re going to do it differently. We’ve lined up a special afternoon show at the Wesley Anne in Northcote– intimate and all acoustic – to showcase our sweeter side. We’re bringing out all the tear-jerking ballads from our Go! Rebelle! LP, plus timeless classics from The Shangri Las, The Crystals, and more. And for the first time ever we’re bringing in a live string section, playing lush arrangements from our own Bobb B Rebelle. All in all, an afternoon guaranteed to send a permanent shiver down your spine. It’s been fun times for us over this past week! We kicked off the weekend by celebrating the 10th anniversary of our first ever gig with our own little party, and were joined by special surprise guest Anna GoGo – we danced and laughed and sang, it doesn’t get much better! And it doesn’t feel like 10 years – thanks to all of you who have supported us along the way. We’ve also been rehearsing for our upcoming show on Saturday 2nd December at Memo Music Hall. We’re supporting The Reefers in a Surf Rock Celebration! We’ll be joined by guest vocalist Dusty Springclean, of Pops fame, for a surfed up Australian classic. This’ll be our only gig until February, so get your tickets via the Memo website before they’re all gone! What happens when an immovable object meets an unstoppable force? Find out when The Reefers go head to head with The Rebelles in a titanic clash to decide once and for all; who holds the Secret of Surf. For one night only, MEMO Music Hall will play host to a cavalcade of surf, turf, and sixties sensibilities, to rattle the halls of Poseidon himself. Featuring the exotic oscillations of Trisnasari Fraser, and the wild style of Richie 1250, this promises to have hips shaking from the delta to the deep blue sea. See you up the front. The Reefers are comprised of all of the original band-members: Mama Sun Reefer, “The” Jack Norton, Evil Al Cordobez, Stonehawke and JT Reefer, they play a hybrid of traditional surf music and the rolling beats of the middle-east. 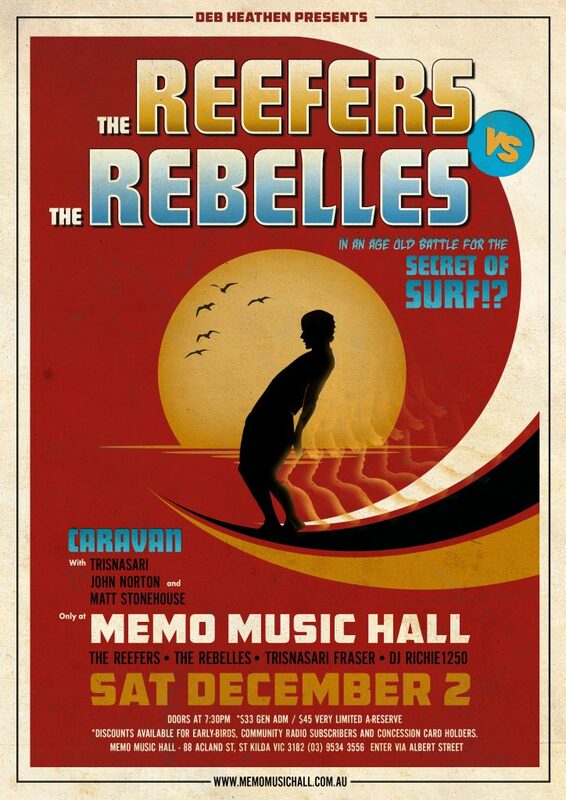 Not to be outdone in the surfing stakes, The Rebelles will be holding their own and then some, cranking out an epic set of beach-friendly rockers with a surprise or 2 up their sleeves. Sharing in the middle-eastern groove, Trisnasari will join Matt and Jack once more to shimmy and delight the audience on the dance-floor. The ship shall be expertly captained by Richie 1250, as he navigates the salty richness of some of the best surf and summer tunes, to keep the celebration going on the dance floor and at the bars. Usually found in the studios of PBS FM and his own Slow Grind Fever events, we thank him for joining us. Book your tickets now at www.trybooking.com/book/event?eid=318899 ! 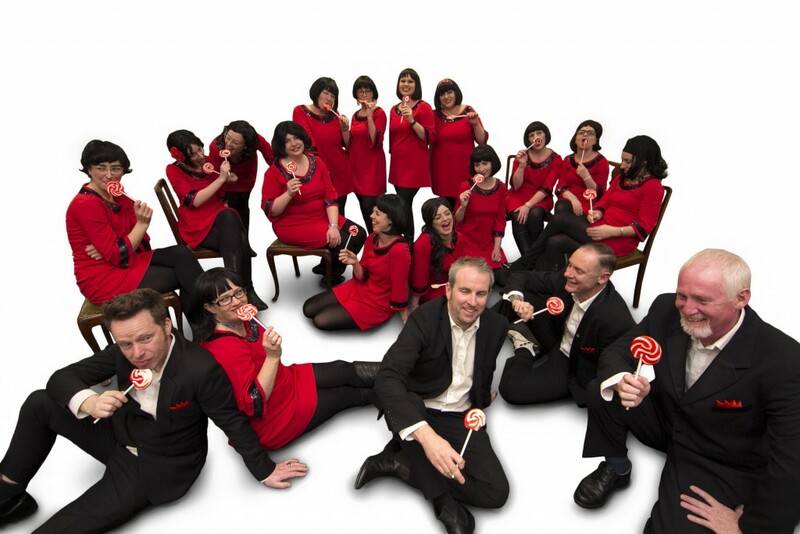 This Saturday, get ready for a genuinely historic night as 2 bona fide Melbourne institutions come together for the first time – The Rebelles hit the stage at Soul a Go Go! Head on down to Bella Union as The Rebelles’ wall of girl group greatness joins forces with Melbourne’s hottest soul DJs in a sensational night of pure dance floor madness. Check your inhibitions at the door, this is one for the ages! The Rebelles are super excited to announce the arrival of their latest brood of all-original rockers, the Shimmy Chillin’ EP! It’s been nearly two years since The Rebelles’ ace debut long player Go! Rebelle! and Melbourne’s premier girlgroup sensation have clearly put that time to good use. The Shimmy Chillin’ EP contains four hot new tracks that showcase the band’s songwriting talents – from moody grooves and bubblegum pop to deliciously devilish doo wop – and is sure to set toes a-tappin’ and hearts a-flutterin’! All in a good-bad-but-not-evil way, of course. And as always with The Rebelles, ears everywhere are set for a treat thanks to that wall of stunning harmonies that you only get from 15 fearless women and only one band! 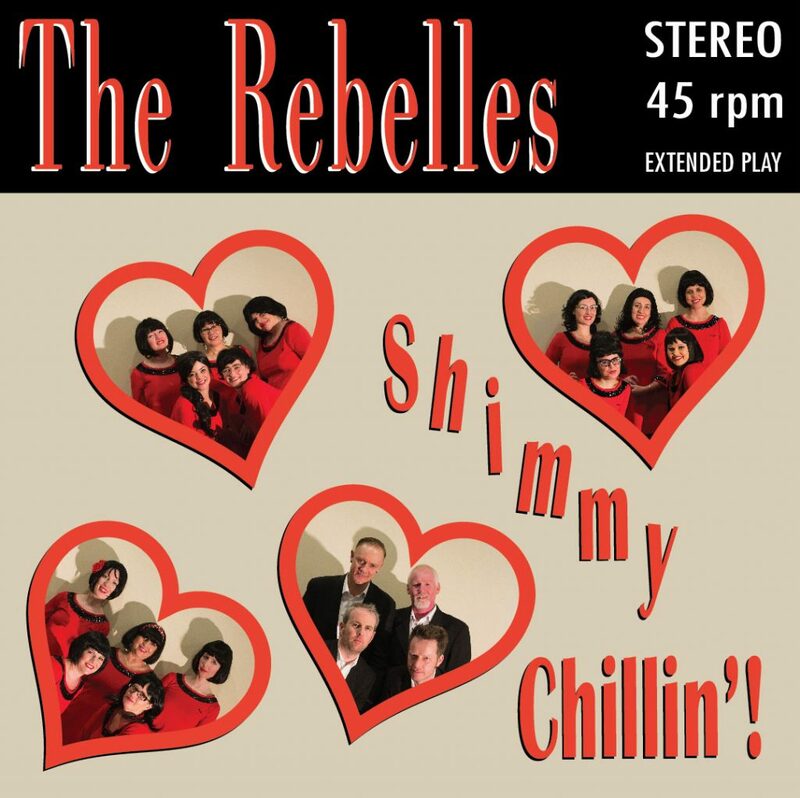 The Shimmy Chillin’ EP will be available on good old fashioned 7” vinyl from the Rebelles’ own online store (pre order now! ), as well as some of the hippest record shops in town. You’ll also be able to find it on iTunes, Spotify and all your favourite online services. We just know you won’t be able to help falling in love with the tunes, and you won’t have to wait too long to hear them live. 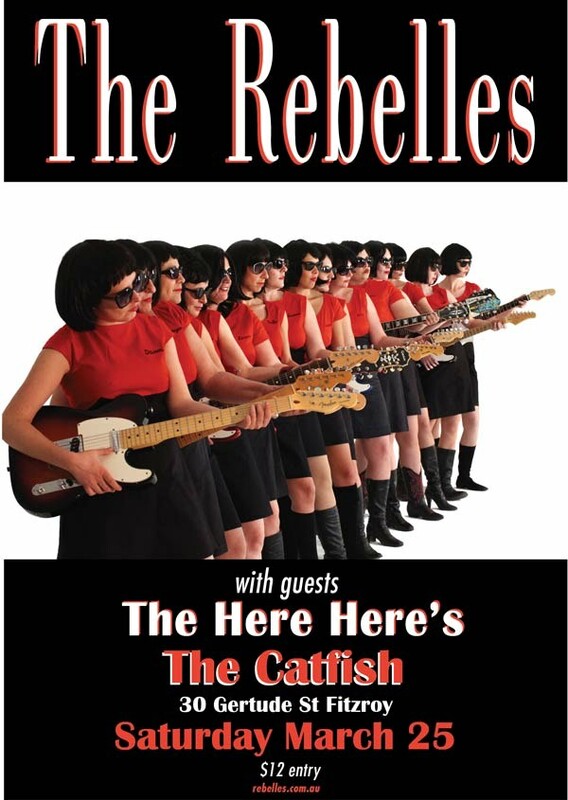 The Rebelles are teaming up with 2 of their favourite Melbourne bands to bring you a pair of killer launch shows – one on either side of the Yarra. On the North side: Friday 5th May at Yah Yah’s, 99 Smith St. Fitzroy – with cool rockabilly cats The Strays. Tickets $15 on the door or book here to make sure you don’t miss out. Doors open 8pm. On the South side: Saturday 20th May at The Flying Saucer Club, 4 St George’s Rd Elsternwick, with the irrepressible Dusty Springclean and the Pops! Tickets $15 pre booked, $18 on the door and $23 reserved seating. Doors open 8pm. It’s Rebelles gig time! Yep, plans for our next super show are all wrapped up and ready to go! Extra exciting news is that kicking the night off will be the compact and hip stylings of The Here Here’s, Melbourne’s finest purveyors of twanging’ instrumental joy! If you’re wondering what would happen if Mad Joe Meek got his tape machine in front of Bad John Barry and Wild Link Wray, well come on down and find out. Stay Rebelleified and we’ll see youse down the Catfish! Our Christmas Gift to You – Christmas (Baby Please Come Home) free download! With our awesome Rebellified Christmas Spectacular only a few days away now – get your tix here – we thought we’d start the present giving early with a free download of our take on Christmas (Baby Please Come Home)! The Darlene Love smash hit, a highlight of Spector’s 1963 Christmas album, has long been a Rebelles live favourite at this most special time of the year. Our version, recorded right here in Melbourne’s Sound Park, the acest of ace studios, starts with a warm seasons greeting before rocking along quite nicely, thank you very much. We then wrap up our Christmas gift up with a personal message from each and every Rebelle to you, the best fans in the world. 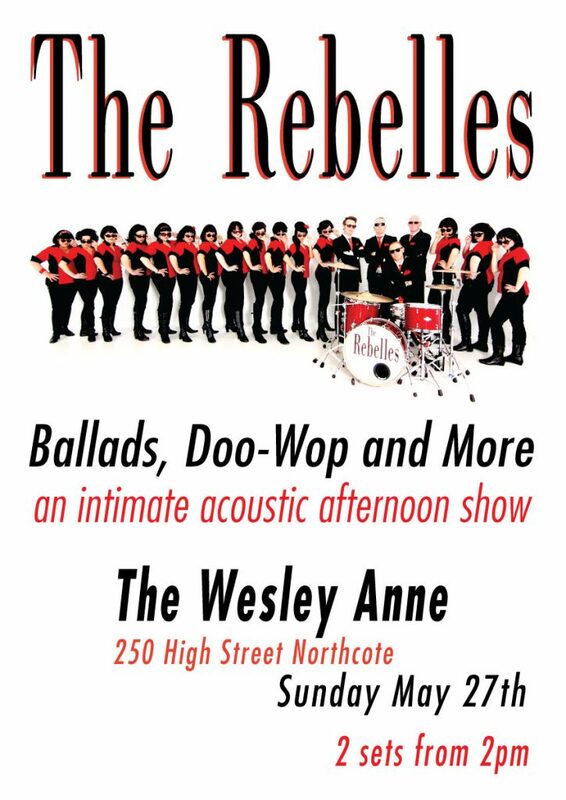 The Rebelles are merry excited to announce the return of their annual Christmas Spectacular at the Thornbury Theatre! Melbourne’s girl group goddesses love putting a festive smile on Melbourne’s dial every year with their unique wall of Christmas classics mixed in with the usual lashings of crowd favourites old and new. This year The Rebelles are getting in early and will be jingling their shiny bells on Saturday 3 December – a perfect way to officially kick start the silly season! Tickets are on sale now, including special Dinner and Show packages.